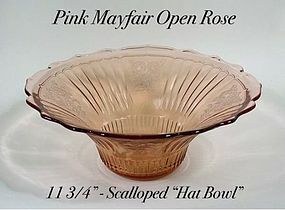 This pink Mayfair Open Rose 11 3/4" hat bowl is in excellent condition. 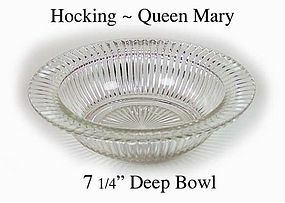 It was made in the 1930's by Hocking Glass. 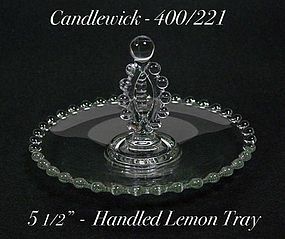 This Candlewick 400/221 Lemon Tray was made by the Imperial Glass Co. from 1947-1967. It is in excellent condition. The size is on the photo. 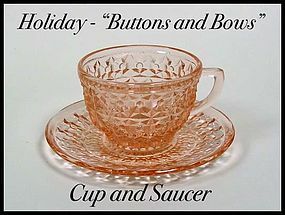 This Holiday "Buttons and Bows" cup and saucer was made by The Jeannette Glass Co. in the 1940's and is in excellent condition. There are 7 cup and saucer sets available @ $6.00 each. 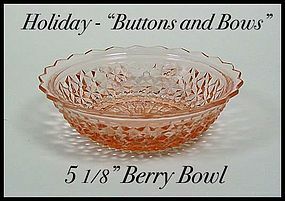 This Holiday "Buttons and Bows" berry bowl was made by The Jeannette Glass Co. in the 1940's and is in excellent condition. 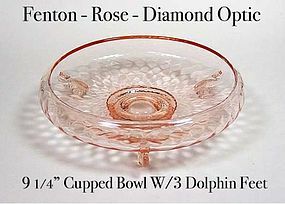 There are 5 bowls available @ $10.00 each. 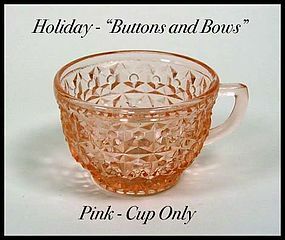 This Holiday "Buttons and Bows" cup was made by The Jeannette Glass Co. in the 1940's and is in excellent condition. This is a cup only...No Saucer. 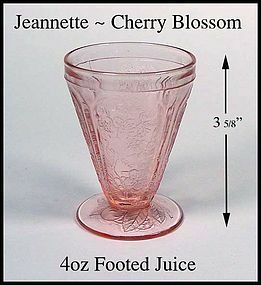 There are 4 cups available @ $5.00 each. 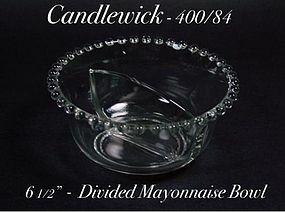 This Candlewick 400/84 divided mayo bowl was made by the Imperial Glass Co. from 1937-1960. It is in excellent condition. 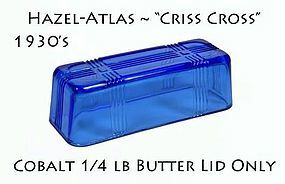 It is 6 1/2" in diameter. 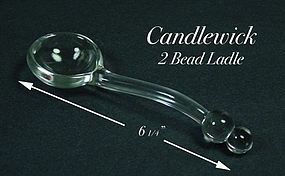 This Candlewick 400/Series 2 Bead Mayonnaise Ladle was made by the Imperial Glass Co. from 1942-1960s. It is in excellent condition. The size is on the photo. 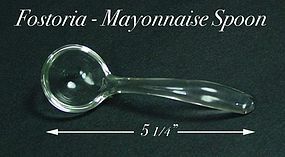 This Fostoria crystal mayonnaise spoon or ladle is in great condition. 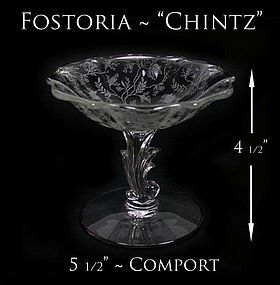 It was used with a lot of the different crystal Fostoria patterns. 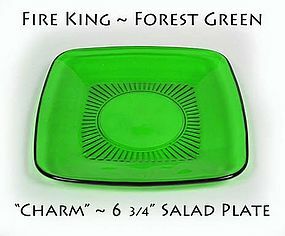 This Fire King forest green salad plate is in great condition. This size plate is hard to find. 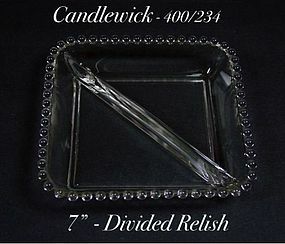 There 2 salad plates available @ $9.00 each. 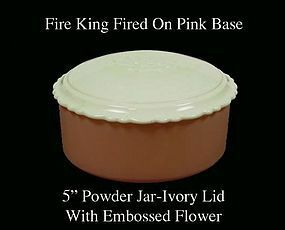 This fired on color, Fire King covered powder jar is in excellent condition. The base is pink, and the lid is ivory. 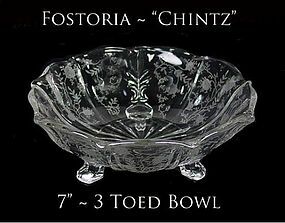 This 3 toed Chintz bowl was made by Fostoria Glass. It is acid etched and in excellent condition! 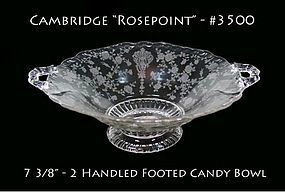 This 4 1/2" Chintz comport was made by Fostoria Glass. It is acid etched and in excellent condition!